The Royal Gorge Dinosaur Experience gives kids of all ages the opportunity to experience science-focused interactive displays, full-scale dinosaur fossil casts, hands-on exhibits with real dinosaur fossils, skinned animatronic dinosaur exhibits, guided tours, and—for added family fun, value and lasting memories—a multi-story ropes course. FUN FACT: This background image is Marsh’s 1896 illustration of the bones of Stegosaurus, a dinosaur he described and named in 1877. The Royal Gorge Dinosaur Experience offers something for everyone, from young children to the young-at-heart, and from visitors who are just learning about dinosaurs to seasoned fossil hunters—click on any of the icons below to start planning your adventure today! The Royal Gorge Dinosaur Experience is thrilled to work with you and your family to plan a perfect birthday party in our architecturally stunning 16,200-square-foot building, or on our 35-acre property. Please call to speak with a representative for details and pricing. Individuals interested in getting hands-on with paleontology lab-work are welcome to volunteer their time at our laboratory, which is operated by the Garden Park Paleontological Society, a non-profit organization that uses our facility to prepare important fossils for scientific research and display. Please call us and ask to speak with someone regarding our current volunteering opportunities. Dinosaur fossils might be old, but they are causing quite a commotion in the news. 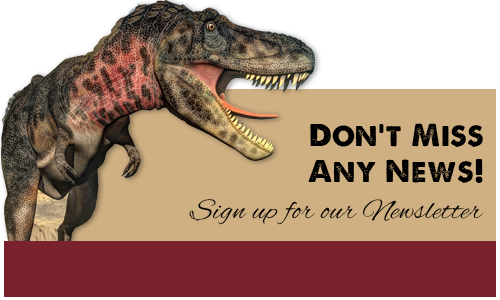 Please click here to read about the Royal Gorge Dinosaur Experience in the news, and read editorial reviews of our museum and facility. The Royal Gorge Dinosaur Experience is situated on U.S. Highway 50, just 4.5 miles by car from the world-famous Royal Gorge, which is one of Colorado’s deepest canyons. Visitors can enjoy the Royal Gorge Bridge & Park, where they can experience the country’s highest suspension bridge (956 feet above the roaring Arkansas River), gondola rides, zip lines and the Royal Rush Skycoaster. Click here for more information. When it comes to white-water rafting, paddlers and adventurers flock to the Arkansas River—Colorado’s premiere white-water river—for a wild ride that takes them through the shadowy depths of the Royal Gorge and over the state’s best rapids. For information about the area’s leading rafting companies that provide many different guided rafting trips on the mighty Arkansas, click here.